One month after the Hanoi Summit between US President Donald Trump and North Korean leader Kim Jong Un, the post-mortems have been done to death. What happened? Who was responsible for the failure to reach an agreement? Does this outcome augur diplomatic breakdown or is it merely a temporary setback leading to future negotiating success? Much ink has been spilled answering these questions. Rather than relitigate the summit to divine how US-DPRK nuclear diplomacy might advance, this article examines the Hanoi Summit from a broader regional perspective, focusing on its implications for South Korean President Moon Jae-in and for China’s competition for influence with the US. It concludes that Moon has seen a decline in political strength and ability to play the role of honest broker between the US and North Korea, while Chinese President Xi Jinping has emerged with greater leverage and room to maneuver through using sanctions enforcement as a card to play in trade diplomacy with the Trump administration. Post-Hanoi, there was near universal agreement that, while Moon was hurt by US-DPRK discord, he can and should try to jump start renewed US-DPRK nuclear diplomacy. This was a natural response to the disappointing summit. Moon had already played the role of diplomatic mediator when US-DPRK preparations collapsed prior to the June 2018 Singapore Summit, which Trump cancelled suddenly and then reinstated following an emergency Moon-Kim meeting in Panmunjom. The same mediation task will be more difficult in the wake of Hanoi. Unlike the Singapore Summit, which was largely a symbolic get-acquainted event, the disagreement between the US and North Korea in Vietnam concerned negotiations on substantive matters. Worse still, from Moon’s perspective, the collapse occurred over the issue of sanctions relief, which Moon needs to persuade Kim to return to negotiations. For the moment, the US has apparently excluded partial sanctions relief prior to complete North Korean denuclearization, which robs Moon of credible arguments that Kim’s return to talks could result in measures he desires, such as restarting inter-Korean economic projects like the Kaesong Industrial Complex or Mt. Kumgang tourism. Moon also faces an uphill battle as diplomatic mediator due to his waning popularity and South Korea’s domestic and international difficulties. Moon has invested significant political capital on successful inter-Korean and US-DPRK diplomacy; consequently, he suffered an 8% decline in popularity following Hanoi, leaving him at his lowest approval rating since taking office. Thus, he needs to get US-DPRK diplomacy back on track precisely when derailed diplomacy is a cause of lost popularity—popularity he will need to confidently reengage as a US-DPRK mediator. His predicament is worsened by myriad internal problems. He has recently reshuffled his cabinet—including the unification minister responsible for South-North relations—in order to energize a government that has failed to address many concerns of the population. He has aggravated a weak economy with well-intentioned but ill-advised economic and labor policies that have led to wage declines for many hourly employees and stubbornly abysmal employment figures. Economic inequality continues to grow, leading to widespread socio-economic bitterness among many of Moon’s supporters. He has failed to rein in the large conglomerates dominating the South Korean economy and derided as unfair oligopolists, while promises of inclusive economic innovation have fallen flat. Pervasive gender discrimination is causing ever greater social tension, and disastrous air quality has nearly everyone disgusted. There is an overwhelming sense of national malaise, of a broken social contract in a country that many Koreans criticize as “Hell Chosun” (using the traditional name for Korea). Moon is only afloat politically because of a hopelessly retrograde conservative opposition tainted by incessant infighting and corruption in past administrations. None of this provides a stable political foundation for Moon to engage in diplomatic derring-do with sharks like Trump and Kim; rather, his predicament is a recipe for marginalization and reaching, vulnerable desperation. Beyond the stiff political headwinds Moon faces, South Korea’s regional diplomacy is in tatters, reflected in Moon’s decision to simultaneously replace his ambassadors to Japan, China and Russia, despite being at a crossroads on sensitive Korean Peninsula diplomacy with far-reaching regional implications. Relations between Seoul and Tokyo are the worst in modern memory, due to historical issues, cheap nationalist point-scoring by both sides, a recent incident involving a South Korean fire-control radar locking onto a Japanese surveillance plane, and inter-Korean détente itself (which Japan views skeptically). The South Korean Supreme Court’s decision requiring Japan’s Mitsubishi Heavy Industries to compensate South Korean victims of forced labor during the colonial period adds to the tension. Sino-ROK ties remain chilly following Beijing’s economic retaliation against South Korean companies in response to Seoul’s decision to allow the US to install a THAAD missile-defense battery on South Korean territory. Seoul’s alliance with Washington renders Moscow naturally aloof. Moon has responded to his diplomatic troubles in Northeast Asia by attempting to cultivate diplomatic and economic ties with Southeast Asian states (the so-called “New Southern Policy”), but success has been mixed. Seoul still has Washington on its side for the moment, but Moon’s high-risk, high-reward approach to mediating between Trump and Kim has delivered neither denuclearization nor sanctions relief. Consequently, his credibility will now be under greater scrutiny. Already the Kim regime has signaled displeasure through media criticism of South Korea’s relationship with the US and temporary withdrawal of employees at the South-North liaison office in Kaesong, one of Moon’s signature achievements in inter-Korean détente. As for the US, in the lead-up to Hanoi and its aftermath, US National Security Advisor John Bolton seems to have taken a greater role. Bolton is deeply skeptical of diplomacy with North Korea and there are reports that his intervention in Hanoi helped scupper a possible US-DPRK agreement on limited denuclearization for limited sanctions relief. Thus, Moon will have high hurdles to cross to provide impetus for Washington to restart serious talks with Pyongyang. South Korea does not currently have any other partners in Northeast Asia besides the US, so Moon can scarcely risk alienating his lone backer. He must be careful to avoid again overselling North Korea’s willingness to negotiate denuclearization, lest the White House develop distrust for its Blue House ally. All this means Moon will have a less enticing pitch for Trump to ramp up diplomacy with Kim. Unlike the much-discussed role for Moon Jae-in in getting the US and North Korea back to negotiations, analysts have commented less on the China angle. In contrast to South Korea, the fallout from Hanoi provides China greater regional leverage and room for maneuver. The principal lever is easily grasped: Chinese manipulation of sanctions enforcement. The Hanoi Summit ended in disagreement partially because North Korea demanded sanctions relief disproportionate to its denuclearization offer. One can deduce that biting sanctions would likely be a primary reason for North Korea to return to denuclearization negotiations. Indeed, despite Pyongyang’s skill at sanctions evasion, there are signs that Kim’s regime suffers from shortages of food, critical industrial inputs and foreign exchange. Nonetheless, North Korea has not collapsed, and China is a major reason. As North Korea’s economic lifeline and primary trading partner, Beijing calibrates sanctions enforcement in order to coerce/reward North Korea. It also does so to assist or undermine US objectives. For instance, a return to “maximum pressure,” which Washington might entertain in an effort to force Pyongyang’s return to negotiations, is not a viable option unless China assents. China’s role as the linchpin of the North Korean sanctions regime plays to Chinese leader Xi Jinping’s advantage as he strives to grow Chinese influence in Northeast Asia at the expense of the United States. Beijing’s ability to modulate sanctions enforcement and allow Pyongyang, which is foreign exchange poor, to run a trade deficit gives it influence over Korean Peninsula diplomacy. For instance, since 2016, China’s implementation of sanctions has shifted from stricter enforcement supporting “maximum pressure” to looser enforcement rewarding North Korea for engagement in denuclearization talks and restraint in nuclear weapons and missile testing. Another example is Beijing’s loose policing of the Yellow Sea (West Sea), one location in which North Korea has circumvented sanctions via ship-to-ship transfers, much to the US’s irritation. With “maximum pressure” off the table, and military options nearly impossible at this juncture, Washington is locked into diplomatic engagement, even if Pyongyang is recalcitrant. If Beijing desires to dilate the diplomatic process, it can loosen sanctions enforcement sufficiently to allow North Korea to delay restarting diplomacy with the US, and most likely from a relatively stronger position. North Korea can then stall and salami-slice on concessions while suffering only modestly increased deprivation. Conversely, if Beijing perceives that US-DPRK negotiations are proceeding in a direction antithetical to Chinese interests, it could presumably turn the screws on sanctions enforcement, thus increasing pressure on Pyongyang to hew to Beijing’s line. 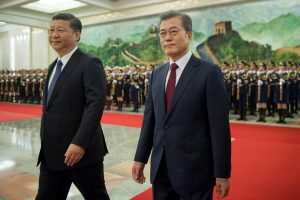 Furthermore, China’s control over sanctions enforcement gives it greater influence over South Korea, particularly as Moon is desperate for a resumption of diplomacy. Finally, China’s ability to employ sanctions enforcement to incentivize North Korean behavior, and especially its potential return to denuclearization talks, gives it a major card to play in the ongoing trade war with the United States. Beijing claims publicly (and perhaps dubiously) that it has not yet linked the two issues—and until now there has been little need for this linkage, insofar as Korean Peninsula diplomacy has satisfied Chinese interests. But Xi holds a weak economic hand in trade negotiations with the US, and his ability to encourage North Korean behavior that either helps or hinders US goals on the peninsula would be a powerful lever to pull to induce the US to accommodate China on trade issues.